Introduction – The campaign in Papua from July 1942 to January 1943, of which the fighting on the Kokoda Track formed a large part was, with respect to the direct security of Australia, the most important ever fought by Australian soldiers. After the Japanese entered the war in December 1941 they advanced rapidly towards Australia, over-running much of south-east Asia and landing in New Britain and on the north coast of New Guinea. In February 1942 the Japanese high command in Tokyo postponed a decision as to whether to invade Australia. Instead they decided to isolate Australia from United States by seizing Port Moresby on the south coast of the Australian territory of Papua, and by advancing through the Solomon Islands towards Fiji. In May 1942 a Japanese attempt to take Port Moresby by sea was thwarted by the battle of the Coral Sea. The Japanese then decided to take Port Moresby by two approaches. The first was by landing on the north coast of Papua and advancing over the Owen Stanley Ranges. The second was by landing at Milne Bay on the south-east tip of Papua. The landing at Milne Bay on 26 August was repulsed by Australian troops with the help of Australian fighter aircraft. However, the Japanese thrust over the Kokoda Track, which also began in force on 26 August, caught the Australians unprepared. If the poorly supplied and lightly equipped Australian troops had not slowed the Japanese advance over the mountains they might well have reached the Port Moresby area in early September. The consequences would have been severe for the security of the Port Moresby airfields. If the Japanese had taken Port Moresby their planes could have dominated the Coral Sea and they would probably have bombed northern Queensland. Who knows, the early decision not to invade might have been modified to allow some troops to be landed in northern Queensland. In any case, it would have been a major task to mount an amphibious invasion to retake New Guinea. Thus the fighting on the Kokoda Track was vital to the security of Australia. But it was the nature of the fighting and the resolution of the Australian defenders which made it one of the heroic episodes in Australian history. The campaign was fought in three phases. The first began on the night of 21 July 1942 when the Japanese landed at Buna and Gona on the north coast of Papua and advanced over the Owen Stanley Ranges before halting at Ioribaiwa in mid September. In the second phase the Australians conducted a counter offensive which by 16 November had driven the Japanese from the mountains. In the third phase Australian and American troops sought to eliminate the Japanese pockets from the beachheads, achieving that aim by 22 January 1943. In the Papuan campaign, which included the fighting on the Kokoda Track, at Milne Bay, and at Buna, Gona and Sanananda, the total Australian and American casualties were 8,546. Casualties from malaria exceeded 27,000; those suffering tropical diseases numbered over 37,000. In the break up of these casualties, the Australians lost more than 2,000 (killed); the Americans 600. During the four months of fighting in the Owen Stanley Ranges, from 22 July to 16 November, the Australian infantry lost 607 killed and 1,015 wounded. To illustrate the extent of casualties, the 2/14 Battalion left Ilolo to cross the mountains on 16 August with a strength of 24 Officers and 517 men. By the time it had been withdrawn from action at the end of September the battalion had suffered a total of 256 casualties – 119 killed and 137 wounded. The number of Papuan natives who died as a result of illness incurred on the Track is unknown but was considerable. At the time of the operations the accounts in the newspaper referred merely to the Owen Stanley Ranges, when describing the fighting on the jungle foot-pad that wound its way from Ilolo in the southern foothills over the towering mountains and then down to Kokoda in the northern foothills. 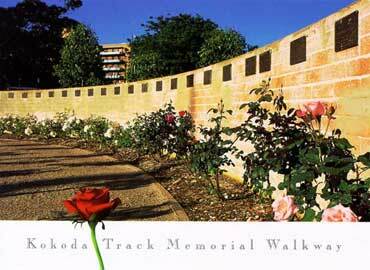 The path came to be known as the Kokoda Track or Kokoda Trail. A Memorial Walkway has been constructed at Rhodes Park, Concord to commemorate all veterans who served in World War II. The Memorial Walkway has been named the Kokoda Track Memorial Walkway in recognition of the young Australians who served on the Track; those young men who fought, died and suffered to keep Australia safe from invasion. The efforts of the native Papuans – the legendary “fuzzy wuzzy angels” are also acknowledged. Cold, hungry and often over burdened, they carried forward the supplies and facilitated the evacuation of the casualties with devotion and humanity. It is hoped that those who tread the path of this Memorial Walkway gain a greater appreciation of the important events that took place in Papua in 1942.